Publisher: Ruth Nyaboe August 25, 2017 This information is provided solely as a guideline. Butternut melts away into the curry, giving the dish a subtle sweetness throughout. Serve it on top of white rice and lentils or just as it is like a stew. ↬½ cup brown or white rice. ↬Sardines, Butternut and Potato Curry. ↬425 g can Lucky Star Sardines in Pili-Pili sauce. ↬2 potatoes, peeled and cut into small chunks. ↬1 small butternut (about 400 gm), peeled and cut into small chunks. ↬410 gm can chopped tomatoes. ↬Salt and ground black pepper. Lentil Rice: Place the rice, lentils, water and salt in a medium saucepan, cover and simmer for about 20 minutes until the rice and lentils are cooked and the water has been absorbed. Stir occasionally. 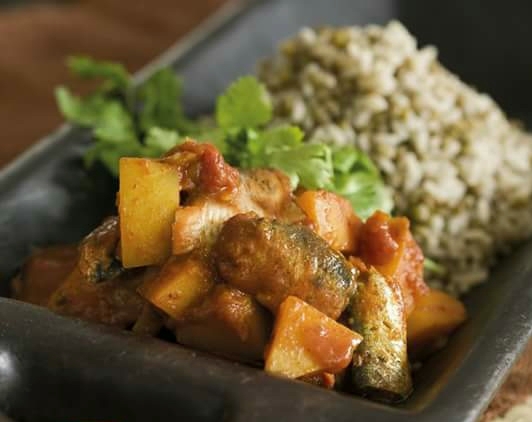 Sardines, Butternut and Potato Curry: Tip the Sardines into a bowl and break into large chunks in their sauce with a fork. Heat a little oil in a large saucepan and fry the onions and garlic until soft. Stir in the curry powder. Add the potatoes, butternut and tomatoes, and season with salt and pepper. Cover and cook gently for about 20 minutes until the vegetables are soft. Stir in the Sardines and heat through. Set aside some of the coriander leaves for garnishing. Chop the rest and mix into the curry. Transfer the lentil rice and curry into a serving dish and garnish with the reserved coriander leaves. Tips: For a milder curry, use Lucky Star Sardines in Tomato Sauce instead.